Magento Restrict Fake Registration allows store owners to restrict dummy signups and spam registration by validating Email domains and character length of the first and last name. Restrict fake registrations by validating domains. Google reCAPTCHA to avoid spams. The issue of fake registration is highly emerging in Magento stores nowadays. Users round the world create the test accounts or fake accounts to place fake orders without the intention to convert. Also, spams register to harm Magento stores that can corrupt their functioning. It may cause the trouble to actual customers. 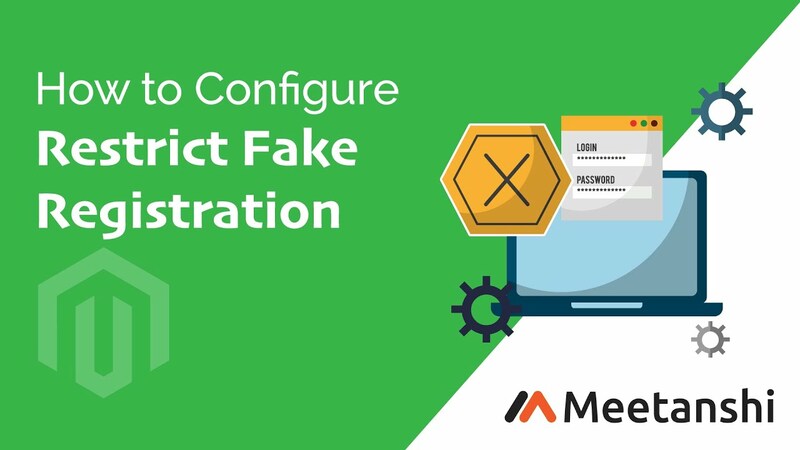 To target both these, Meetanshi has developed Magento Restrict Fake Registration extension that can be used to restrict customer account creation by dummy users and bots. Protect your Magento stores from spammy bots. Avoid fake customers create a dummy account in the store to unnecessarily handle its data everything with Magento Spam Protection module! The Magento Spam Protection extension allows restricting any number of Email domains (TLD) used in creating an account. Also, admin can restrict the character length of the names of users as artificial bots have long randomly generated names. Moreover, enable Google reCAPTHCA v2 from the backend for additional security against spammers. Improve the Magento store functioning by restricting bots and avoiding customer registration spam with Magento Bot Stop module. Enhance user experience with improved store health! Validate account registration by restricting any number of Email domains from the backend. Impose restriction on the character lengths of the first name and last name of the user creating the account. Google reCAPTCHA to keep bots away from creating Magento customer accounts. Deliver an improved customer experience with secure Magento store! Note: This extension is only tested with default Magento Registration Page so it might need further customization if you want to work with customized Registration pages.